Through the Digital Innovation Council for the Performing Arts, CAPACOA has shared draft plans for Phase 2 of the Digital Innovation Council for the Performing Arts. These are a series of potential digital projects identified over the course of Phase 1, Digitizing the Performing Arts: An Assessment of Opportunities, Issues and Challenges. We know several people/organizations are looking at data strategies, especially semantic web and semantic web automation to enhance live event discoverability, business back-end platform improvements and perhaps revolutions, and more. Participants in these conversations are moving to digital actions; sorting out what they want to do next and how to collaborate with a profound spirit of generosity. We all figure funding for the truly worthy breakthrough digital projects will follow. For some a key avenue for public funds will be through their eligibility for the Canada Council for the Arts’ Digital Strategy Fund, that will become available in the fall of 2017. Others may need to follow a tech start up model. It is a brave new world we are beginning to inhabit and get our bearings. This entry was posted in collaboration, Digital Innovation on August 2, 2017 by Inga. The Globe and Mail took up our report in this article by Kate Taylor. Le Devoir also published a review and discussion of this important report. This entry was posted in Digital Innovation, performing arts, strategic moves, vision on May 30, 2017 by Inga. Here is my interview from today with CBC North. This entry was posted in Digital Innovation, leadership, performing arts, vision on April 11, 2017 by Inga. The thrill of release! Yes, we published today our latest national report – already billed as landmark 😉 – titled Digitizing the Performing Arts: An Assessment of Opportunities, Issues and Challenges. It is also available in French: La numérisation des arts du spectacle : Évaluation des possibilités, des enjeux et des défis. I hope that this assessment provides a springboard for new conversations and digital capacity in the presenting field. The question at the core of this work is who will be the digital intermediaries for the performing arts; and whether the presenting field can carve out a digital space that supports and benefits the entire performing arts eco-system. Doing so, I think, would require both a transfer and an expansion of the arts presenting expertise we see on the theatre platform to new digital platforms. 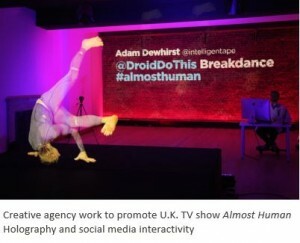 Can live arts presenters re-invent distribution of performing arts at digital scale? How will Canadian artistic talent be nurtured and supported to grow viable careers and earn fair compensation in the digital realm? How can we, and should we, as a free, vibrant society assure a broad diversity of voices that reflect all of Canada is heard in digital spaces as well as live performance spaces? What is the future of live Canadian theatre, dance, music and other performing arts as digital technologies and capacities of data networks continue to advance? 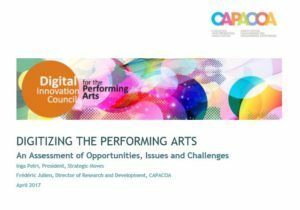 This report by CAPACOA and Strategic Moves is the culmination of several years of conversations that emanated from our study on The Value of Presenting: A Study of Performing Arts Presentation in Canada. We are grateful for an initial round of financial support from Canadian Heritage to undertake this assessment. On a personal note, I so appreciate and enjoy working with my colleague-client, Frédéric Julien, Director of Research and Development at CAPACOA. He is a tireless advocate in the arts; and equal parts smart, rigorous in his thinking and affable. Thank you, Frédéric, for your work and your collaboration! This entry was posted in collaboration, Digital Innovation, leadership, performing arts, research, strategic moves, vision on April 11, 2017 by Inga. 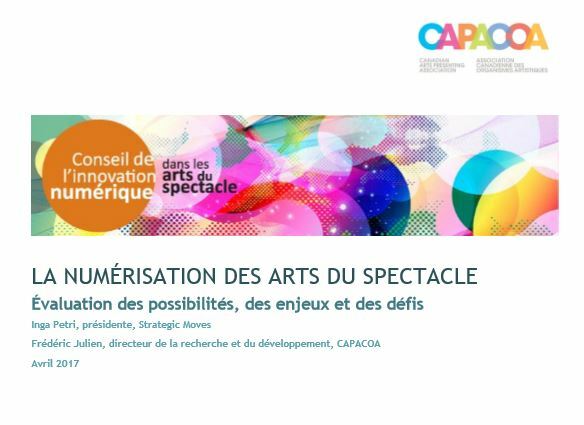 On Monday March 13, CAPACOA and Strategic Moves will facilitate an interactive web conversation on Digital Innovation in Performing Arts Presentation. Everyone is welcome to participate (10 am Pacific/1 pm Eastern). 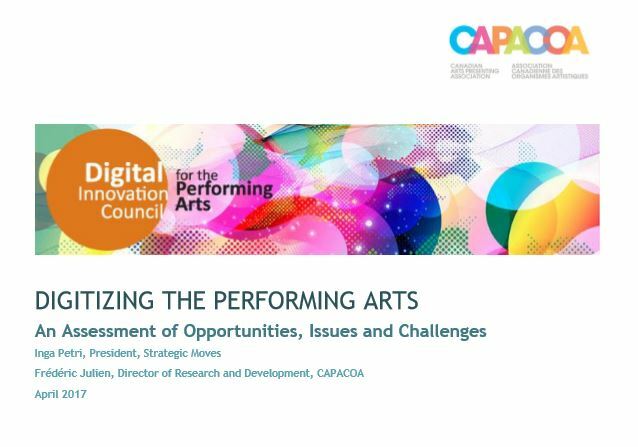 My colleague, Frederic Julien at CAPACOA just published a post with very high level summaries of recent events and reports from the perspective of the performing arts: http://capacoa.ca/en/news/field/1517-digital-conversation-intensifies. This entry was posted in collaboration, Digital Innovation, leadership, performing arts, strategic moves, vision and tagged Written by Inga Petri on March 9, 2017 by Inga. At the CAPACOA conference in Halifax this past January, attendee feedback suggested that I made a compelling case for Breaking the Fifth Wall: Digitizing the Performing Arts. Indeed, attendees were buzzing with the challenges and opportunities presented. Others who have watched the presentation online have asked me how they can get involved. You can watch my talk here on video. In it, I weave together a case for sector-leadership and sector-ownership in developing a future digital platform. 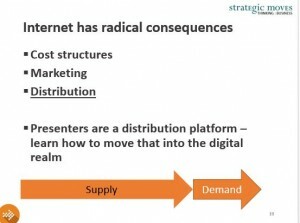 I am most excited about digitization beyond the 2-D screens we have today. In particular, I believe a future-oriented perspective requires us to contemplate live-streaming/streaming 3-D renderings; holographic and or virtual reality convergence in technologies. Things most of us have never seen but enabling technology solutions are advancing rapidly. In this talk I offered a brief context of digital transformation in the last 20 years, an overview of experiments in digital performing arts presentation from around the world, a perspective on what it take to transform the challenging economic model that persists in live performing arts for the presenting field in particular, and a call to action. At the upcoming CAPACOA national conference in Ottawa from November 25 to 28 I hope to turn that buzz into tangible action: Together with CAPACOA, we invite you talk about the next steps we as a sector want to take to drive this discussion forward and explore opportunities of digital distribution at scale in Canada and beyond. Can we establish a working group to spearhead conversations and build sector leadership on this central issue? Who wants to be and needs to get involved? I am looking forward to facilitating this conversation on November 26 at 8 am. This entry was posted in collaboration, conference, conversation, Digital Innovation, economy, innovation, leadership, performing arts, relationships, strategic moves, strategy, vision and tagged Written by Inga Petri on October 25, 2015 by Inga.